Introducing the Eagle Valley Library District's new Digital Archive. Are you interested in viewing thousands of photographs from early Eagle County or maybe a map of Fulford geology? We are, also. For the first time, all of this can be viewed anytime from our website. You can read more about our Digital Archive, whatâs in it and how to use this amazing new service at www.evld.org. 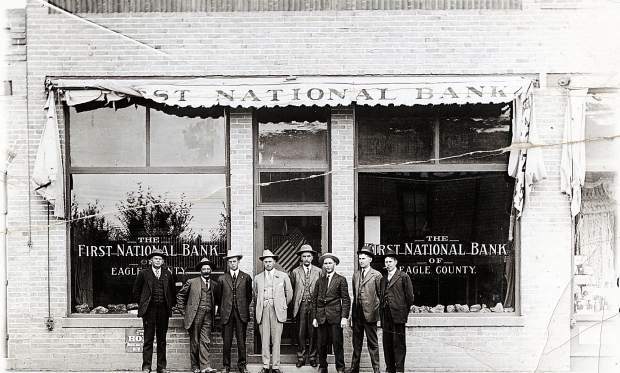 The photo attached is of the First National Bank of Eagle County, which was organized in 1908. The men standing in front, who are stockholders and bankers, are, from left; Gulling Offerson, a Beaver Creek rancher; Oscar Kempf, a developer of the Lady Belle mine; Charles McCarthy; Ben White, a Brush Creek rancher; John Welch, who is possibly Welsh; Jesse Shryack; Bud Tandy; and Art Tandy, banker and the original stockholder. The photo was probably taken between 1915 and 1921, given that Art Tandy left the bank in 1922 for a banking position elsewhere and he died in 1928.